The extensive use of targets in governance keeps the CCP responsive to changing demands. The Chinese Communist Party (CCP) remains in power because its governance system has proven flexible enough to either respond to or preempt emergent social, economic and political pressures. In a recent Diplomat article, the authors argue that broad public support of the CCP and high political trust – “a belief in the legitimacy of the government” – is due to “government responsiveness to public demand.” Performance targets account for that responsiveness. In democratic systems, if people are dissatisfied with one party, they simply support another. Losing parties then conduct polls and find new strategies to convince the public to vote for them in the next election. In China, there are no second chances for the CCP if public dissatisfaction erupts. Deng Xiaoping’s maxim, “stability overwhelms everything” holds true. To avoid public dissatisfaction, “authoritarian upgrading” is key; but without elections and with infrequent leadership changes (every ten years at the highest levels) the CCP must also employ other, internal adaptive mechanisms. In fact, the party uses performance targets (kaohe zhibiao) and cadre evaluations (ganbu pingjia) to adapt and thus preempt threats to its legitimacy. This system of bureaucratic targets and controls forms the backbone of contemporary Chinese governance and helps account for CCP resilience. Performance targets are essentially yearly goals assigned to government departments, local governments, firms and individual cadres. Targets are used in service of goals articulated in central Five-Year Plans (FYP) or from other ad hoc plans articulated by central departments and local governments. There are both broad governance targets used to assess leading cadres and local People’s Governments and specific policy performance targets. Targets set priorities for local agents and provide a framework for achieving goals, as well as providing a benchmark for assessment at the end of the year and a basis for comparison across time. Importantly, some broad governance targets can vary in ranking regionally, while some, such as population control (a veto power target), are set centrally and cannot vary. Other targets, such as economic growth, are not set centrally, but are almost always hard targets due both to central pressure and local incentives. At this level, targeting is primarily about balancing government priorities. Cadres that perform well on quantifiable, hard targets get promoted faster and receive honorary titles and higher year-end bonuses, while those that do not could face fines and termination. Policy area performance targets use the same ranking principles, but focus on specific policies and apply to firms and government departments, in addition to cadres and local People’s Governments. Policy scoring tables summarize targets and tasks and assign points based on their relative importance. The development of scoring tables is an important source of policy innovation. Through consultations with experts, government officials, cadres and managers, local and provincial governments determine which specific targets to use and how to distribute points. Differing strategies either develop organically in reaction to a broad policy goal, or can result from deliberate experimental points set up by the central government. Then, the central government, based on differing local experiences, can determine which strategies work best and develop national standards. Preference is given to targets that are specific, quantifiable, relatively easy to collect, consistent and uncorrelated. Higher ranked targets are allocated more points. Failure to meet the goal could result in loss of bonuses and promotions for the leading cadres responsible and financial and administrative punishments for local governments and enterprises. More points are assigned to those goals that will ensure other tasks are completed. 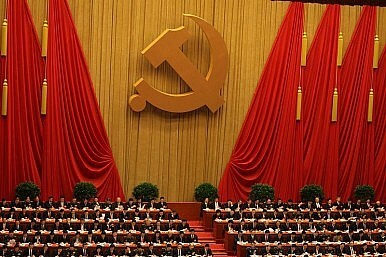 What’s So Controversial About China’s New Anti-Corruption Body? Digging into the National Supervision Commission.